LONDON—Uber told a British employment appeal tribunal on Wednesday its drivers were self-employed, not workers entitled to a range of benefits, less than a week after it heard it would lose its London license. Losing its license in London, one of the world’s wealthiest cities, is one of the U.S. technology firm’s biggest setbacks so far. The London regulator cited the firm’s approach to reporting serious criminal offences and background checks on drivers. Last year, two drivers successfully argued at a tribunal that Uber exerted significant control over them to provide an on-demand taxi service and had responsibilities in terms of workers’ rights. At the two-day appeal hearing starting on Wednesday, Uber said its drivers were self-employed and worked the same way as those at long-established local taxi firms. The self-employed are entitled to only basic protections such as health and safety, but workers receive benefits such as the minimum wage, paid holidays and rest breaks. This would add to Uber’s costs and bureaucracy across Britain. 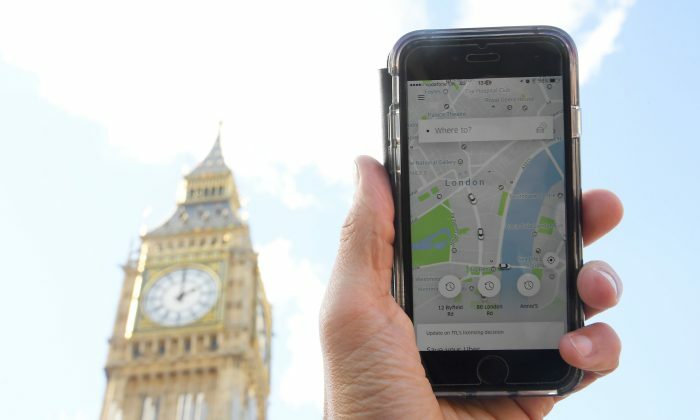 “The position of drivers who use the App is materially identical to the (familiar and long-established) position of self-employed private hire drivers who operate under the auspices of traditional minicab firms,” Uber said in its court submission. Minicabs, or private hire vehicles, sprung up in Britain more than 50 years ago. Minicabs cannot be hailed in the street like traditional taxis, but can be booked for specific times and places via a registered office with a call or via the internet. Around 200 trade union-led protesters marched through central London on Wednesday against what they called “precarious labor” in the “gig economy”, where people work for various employers at the same time without fixed contracts. “All Uber want to do is flood the market with drivers, with no responsibility nor liability – keep reducing fares to attract more customers, while drivers carry all the risks,” Yaseen Aslam, one of the two drivers involved in the tribunal claim, told the protest. Some, however, opposed the decision by London’s regulator to strip Uber of its license, saying the firm should be allowed to operate but must grant workers’ rights. In a bid to strengthen itself in Britain, Uber said on Wednesday it was seeking to appoint a UK chairman, in a newly created non-executive role which it began recruiting for around six weeks ago. In a further challenge for Uber, law firm Leigh Day said it would represent a female driver who says Uber is putting her and other women at risk as drivers do not know the passenger’s destination until they get in the car, and that could mean traveling to a remote or unsafe area. “One of the main reasons why women choose to drive with Uber is because of the safety features in the app. All trips are GPS tracked and a driver is able to share a live map of their trip with a friend or loved one,” he said.